Earlier today we played the I Ain’t Been Shot, Mum V3 Rulebook Scenario #2: South of Cherbourg. I've not played enough IABSM to really be familiar with the rules: this year will change that, and my brother and I will look to learn them thoroughly. We'll work through the book scenarios and go from there. Just a few pictures of the game with some brief commentary. The table, US entering from right top. 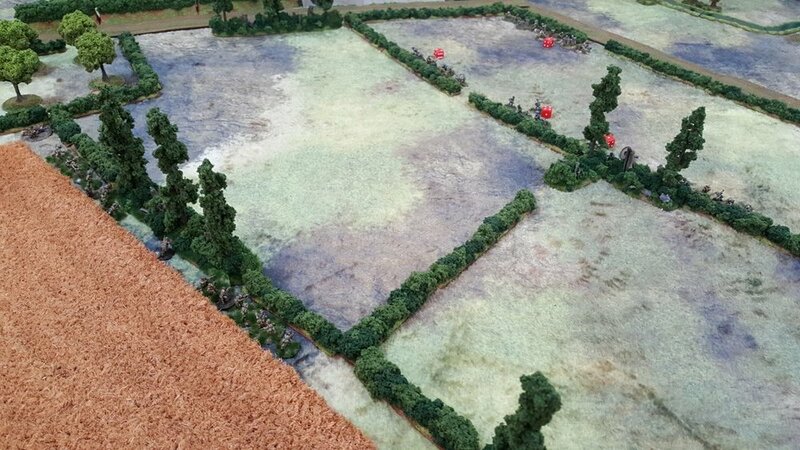 US pushed hard on their left (on Blinds) and bumped into a German squad, pretty much wiping them out for light losses. A German MG-42 opened fire from the top window of the farmhouse, inflicting a few casualties on the newly-arrived US Weapons Platoon (top, near road). The Blind in the orchard would reveal another US Rifle platoon, the one near the top was a dummy. Fighting over the house saw a German squad on the ground floor repulse the first assault, but then fall to the second US Squad. The MG was overrun soon thereafter. On the German left, fire was traded with the third US Rifle Platoon but the Germans (even with an MMG) got the worst of it. 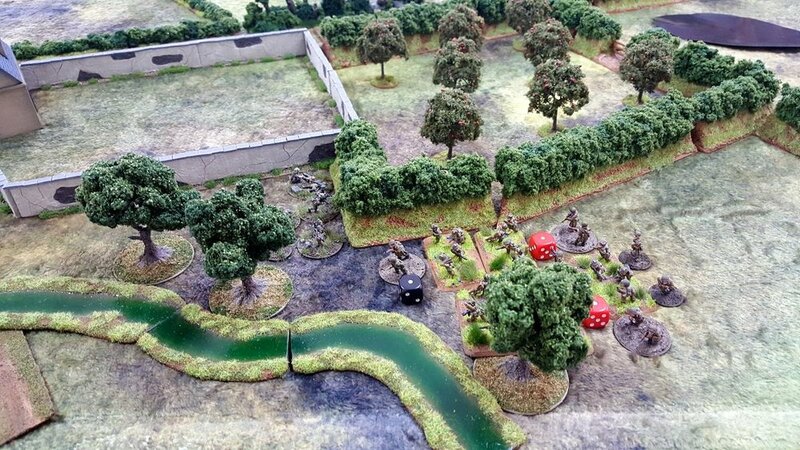 The second German MG-42 succeeded in doing very little, taking a lot of Shock, and when the German CO went over to rally it off they obviously all jumped up and saluted as he was hit next...they then took two hits followed by two more and I rolled double 6s for each...typical. The Grenadier Squads had by this point all taken a beating and it was fairly obvious that the US, having secured the crossroads, would push through and take the Chateau.